THIS SINGULAR SET... IN STOCK NOW! 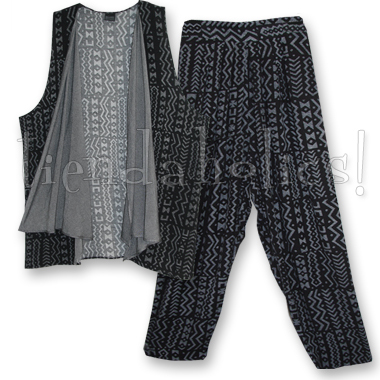 This sensational silver-weave and tribal pattern susti set makes one wild and comfy combo! The silver fabric is not a dye -- it's the product of a tight weave of black and white threads that create a perfect heathery gray! And this luxurious silver susti is the star of this deliriously soft set... IN STOCK NOW! It's twilled and woven on traditional looms in Morocco, the YUMMIEST cotton/rayon susti (susdi), which I call the cashmere of cottons... if you don't know susti yet, you'll wonder how you lived without it!